Being pregnant gave Rebecca Connelly, a 17 year old from Consett, a chance to discover the cancerous tumor that was growing inside her body. When Rebecca became pregnant in February last year she also had an accompanying abdomen pain. Fearing that it might be some pregnancy complication she went to her doctor for a scan and found out she actually had a tumor the size of a melon attached to her kidney inside the body. Rebecca was diagnosed with a Wilm’s tumor which is a kidney cancer usually seen in kids under the age of five. With the appropriate diagnosis now her mother Shannon believes that Rebecca could have been suffering as a child but at that time the cancer was not detected. After the discovery Rebecca and her fiance Alex Birdsall, had to make the painful decision of terminating the pregnancy. Because of the years it had remained in her body, the tumor had grown and had even attached to the main artery pumping blood to the heart. While removing the tumor doctors damaged the artery which caused a four hour surgery to be stretched to 9 hours with Rebecca spending another five days in the intensive care. 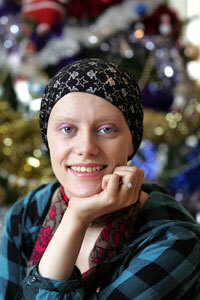 After undergoing chemotherapy doctors declared her totally cancer free this Christmas. Sir Elton John and David Furnish Welcome a New Baby!